The first thing to note about Dananananaykroyd is that their sense of themselves as a unit is perhaps stronger than that of any other band currently operating. You can hear this cohesion in every song, in every thunderous crash and bang, and it's so simply achieved. The second thing to note about Dananananaykroyd is that they privilege enjoyment over everything else. Their live show is a sweaty, flamboyant and hugged-out affair, and they seemed to have attempted to distill this into Hey Everyone!. As far as statements of intent go, they rarely come more succinctly than the opening title track – a short and triumphant crash of precision finger-tapping and quadruple cymbal action. The intent turns to resolve with 'Watch This', the whole band emphatically chanting their own name before the true hyperactivity begins. Calum Gunn and John Baillie Jr's twin vocals are a constant delight throughout, always hysterical and almost bickering with hilarious abandon. Gunn immediately asserts a jovial tone with a girly “Hiya!” and it's left to the ensemble to provide the weight – which they do with immense power and style. 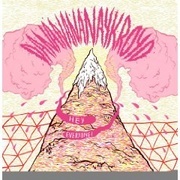 One might envisage a template for Dananananaykroyd's songs – they skip and play awhile, but there's always an explosion. With 'Watch This' it comes after athletic rim shots and gentle backing vocals. The explosion itself is the purest expression of pop fury imaginable, shocking volume, big chord changes, singable guitars and yelping. It can be seen again in 'Infinity Milk', newly extended since appearing in embryonic form on their exceptional debut EP, Sissy Hits. Here, the quiet descends after a fiery chorus for a solitary restatement of the guitar theme before everything arrives again and we're pushing on towards near-destruction of the vocals. Importantly, the non-vocal instruments remain controlled in their exuberance. It's almost unfathomable that a group of six people can produce such concentrated energy. An explanation might be that, besides their sheer vigour, the confines of the rock ensemble allow Dananananaykroyd to habitually bash at their perimeters. Squash your unbounded energy into the smallest space possible, then watch it fly out with unbridled glee at the opportune moment. David Roy's guitar sound and technique is in debt to Ian Williams as much as Billy Corgan. The duelling guitar harmonies of album-highlight 'Some Dresses' recall the pomposity of Thin Lizzy, but coupled with a seriousness, an aggressive fun-factor that transcends mere histrionics. The bombastic outro of closer 'Song One Puzzle' neatly steals the same E major thunder of 'Cherub Rock', but lays a foundation of nimble, jittery unisonic stabs to offset it. Throughout, there is much evidence of scholarly attention to detail. The evocation of sewing machines and spinning wheels at the end of 'Some Dresses' is masterful, a contemporised and clarified version of genius sonic painters – notably Gretchen's spinning wheel in Gounod's Faust. Hey Everyone! doesn't so much succeed as defiantly swirl around and announce, with authority, that you're going to listen and love. Balancing the intricacy with the exuberance has proved to be a terribly valuable tool, and one that ensures Dananananaykroyd's appeal will extend to a healthy mix of the thoughtful and the manic. The unity they've created is palpable through each song, and it could make this six-piece one to remember for a long time yet.